Do-it-yourself repairs not only cut costs, they also help improve the look of your home. Replacing vinyl siding is a great way to add value to your property, make it more safe and improve energy efficiency. Consider durability before budget: The cost of vinyl siding is determined largely by the gauge, or thickness, of the panel. Thicker panels are more durable and offer greater protection against the elements. Choose a panel with moderate thickness, like .042 to .045, rather than the thinnest gauge. Thicker panels should last longer, helping you avoid the need to repair again too soon. Prevent mold: There are two steps to follow to ensure that moisture does not get under your siding, causing mold. First, choose a siding system designed to prevent mold and mildew. Second, make sure you thoroughly clean the surface you're working on and seal all holes before you begin to install new siding. 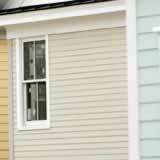 Choose classic colors: The most common vinyl siding colors are white, light brown and cream. Dark colors tend to absorb heat and fade faster. When replacing vinyl siding for your home, be sure to consider how the color will affect your home's curb appeal. Insulation insights: Whether attached to siding or added behind it, insulation helps improve your home's energy efficiency and prevent heat loss. To see substantial energy-efficiency benefits with siding, you generally need to reinforce with additional insulation. Study the R-Factor on insulation before buying. The higher the R-Factor, the better insulated your home will be. Avoid beginner's bloopers on your home improvement project by taking these tips to the hardware store, home improvement center or online shopping guides. Manufacturers should also be able to answer more questions about more specific products.